Click on the bars below to all the subdivisions and condo & townhome complexes in Louisville. You can also view the most popular searches such as ranch style homes, new construction, homes with a pool or houses with mountain views. Click to see Local Subdivision and Complex Maps. 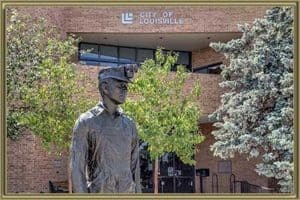 Louisville encapsulates many of the reasons homeowners love living in Colorado. Offering stunning communities set amongst amazing natural scenery, Louisville, CO, provides an excellent blend of urban living with outdoors adventure. Sitting southeast of Boulder, just eight miles from Denver, Louisville boasts everything you could want from living in the city, but is also a stone’s throw from the soaring Rocky Mountains. Reflecting the diversity of Louisville, homeowners have flocked to the city, making it among the most sought-after places in the North Metro region. Families have been particularly drawn to Louisville, not least because it offers a wonderful selection of subdivisions and homes and sits within commuting distance of Denver and Boulder. Affordability and interesting homes are best defined in Hillsborough West, Mesa Point, and Sundance, each offering well-featured properties. More upscale living is available at Bridgefield, Grove at Harper Lake, and Old Town, where homes are generously sized and luxurious. Leisure is important, and few sports draw people like golf, so imagine being able to step directly from your house onto the greens. This is possible at Coal Creek Ranch, a notable golf course community in the heart of Louisville and a must-see for golfers. As an evolving city, Louisville also has several new subdivisions, including the developments at North End and DELO Townhomes. Homeowners with children will send their kids to be educated in the Boulder Valley RE-2 school district. Louisville offers amazing homes in a variety of subdivisions, so choosing which is best for you may be a challenge. Mike Lies and the team at Gold Compass Real Estate make the process easier by providing expert advice on subdivisions, schooling, amenities, and more. We are experts in Louisville real estate, allowing you to gain knowledge and confidence when purchasing a property. While homeowners flock to Louisville, CO, some residents are looking to sell. That’s the nature of the real estate market, so at Gold Compass Real Estate we also offer our expertise to residents selling property. We know the local market better than anyone so can advise you on prices and trends, and we also allow anyone to check their free Louisville Home Value Instantly Online. Buying a home is one of the biggest decisions of your life, which is why Gold Compass Real Estate wants to ensure you make the right one. Our team of experts comprises leaders in the real estate market in Louisville and across the Denver region. Check out our online listings for up-to-date information on homes available in Louisville. Download a complementary Free Personalized Market Report for more details. For more information, contact Gold Compass Real Estate on 305-325-5690.